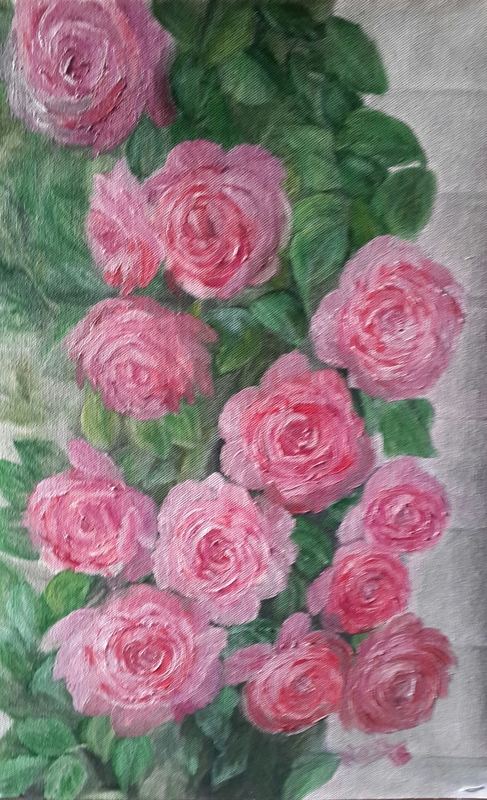 Pink Roses in a Crystal Vase is an original oil painting. The magic of RYB has helped me mix numerous colours which have been used in this painting. The crystal vase is placed on a wooden oval table. The edges of the table and those of the window sill and the boundary wall provide depth to the painting. Grey clouds are visible in the sky outside. The dark curtain provides a backdrop to the flower arrangement. The light and shadows on the vase along with the stems of the flowers give vase its shape and character. How individual flowers have a character, personality and aroma of their own? The folding and unfolding of petals, covered and exposed stamens and tilting of heads of few flowers. 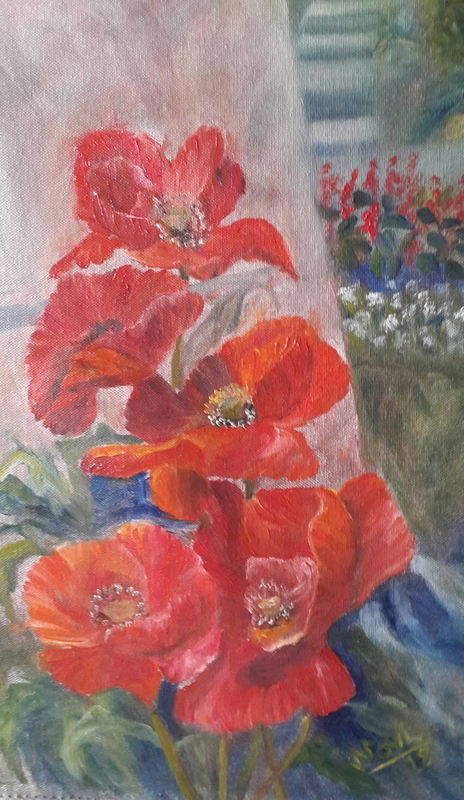 Poppies in my Garden 2 is an attempt to explore these differences and depict them through a medium of oil painting. 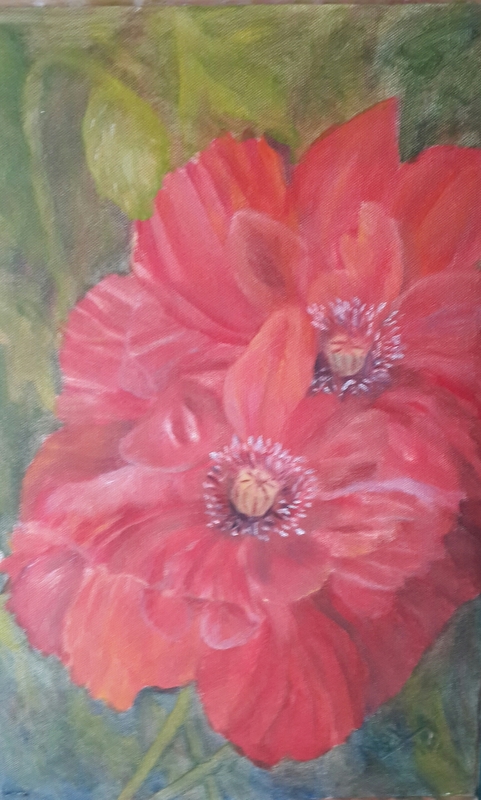 Poppies in my Garden 2 is a sequel to the previous poppy painting. 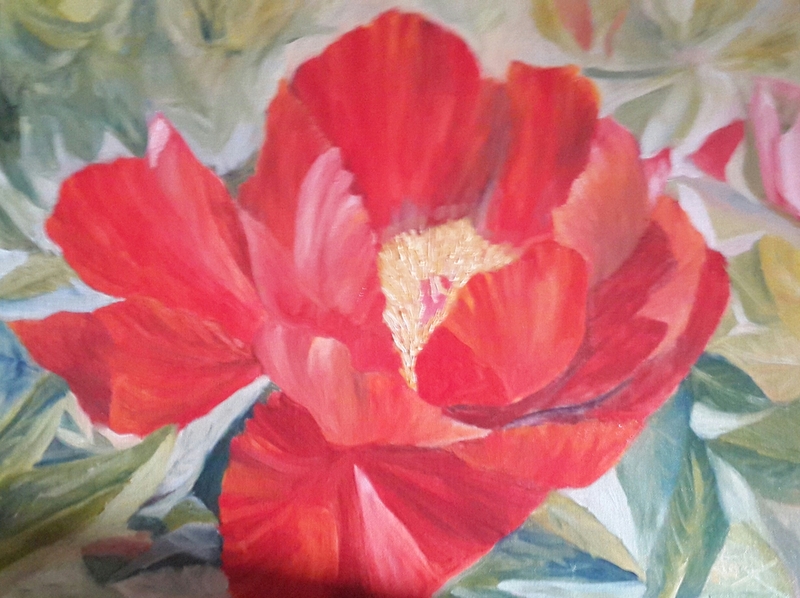 Both oil paintings have five flowers in them. The shape of the flowers is different in this sequel and they have been painted from a different angle. The stems are more visible. The buds add drama to the composition. 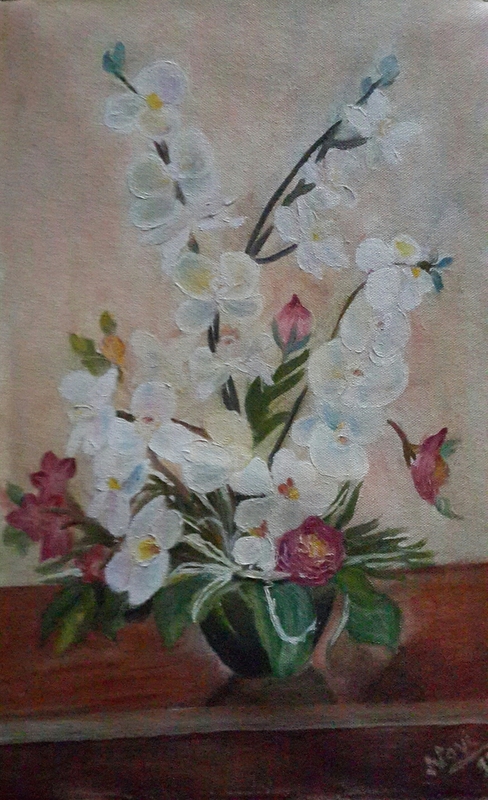 The white and red flowers in the background add the required depth to the painting. 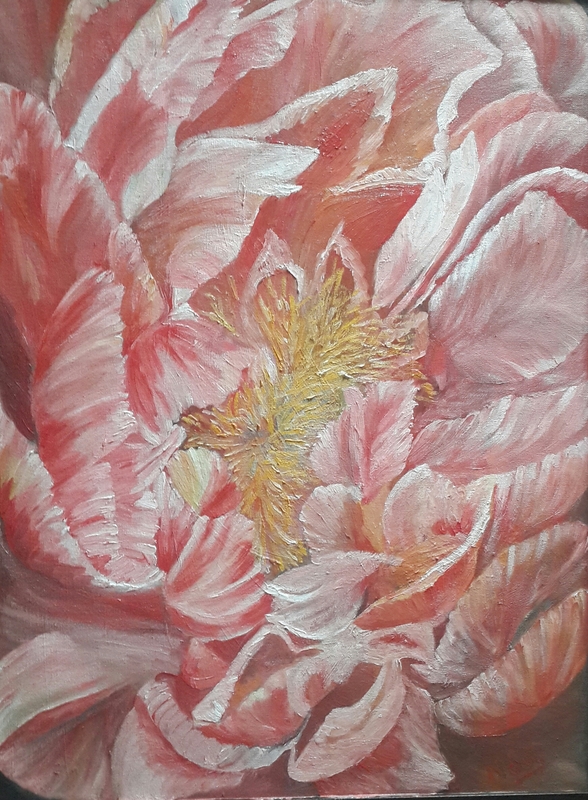 There is more light on the flowers that is causing the stamens to be white in colour as compared to yellowish ones in the previous painting. 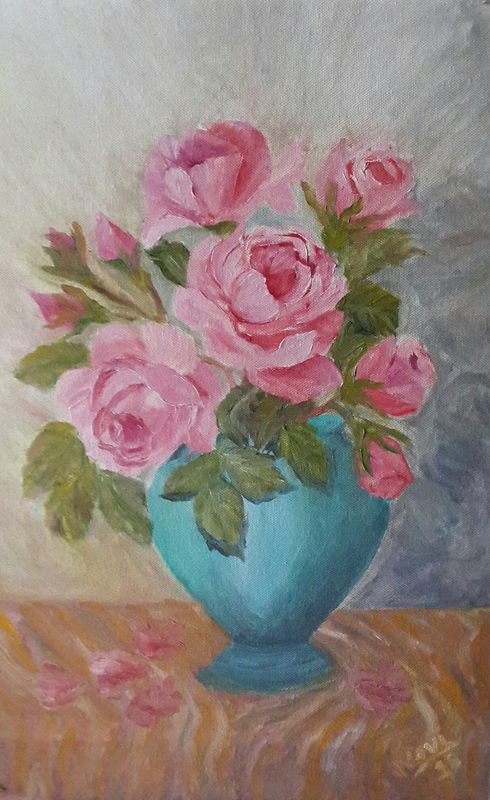 Peach Roses in a Blue Vase is an original oil painting. Creative work is a source of immense joy and satisfaction. The sharp front edge and softened rear edge of the wooden table provide depth to the painting. The shapes and colours visible on the vase intrigued me while painting. 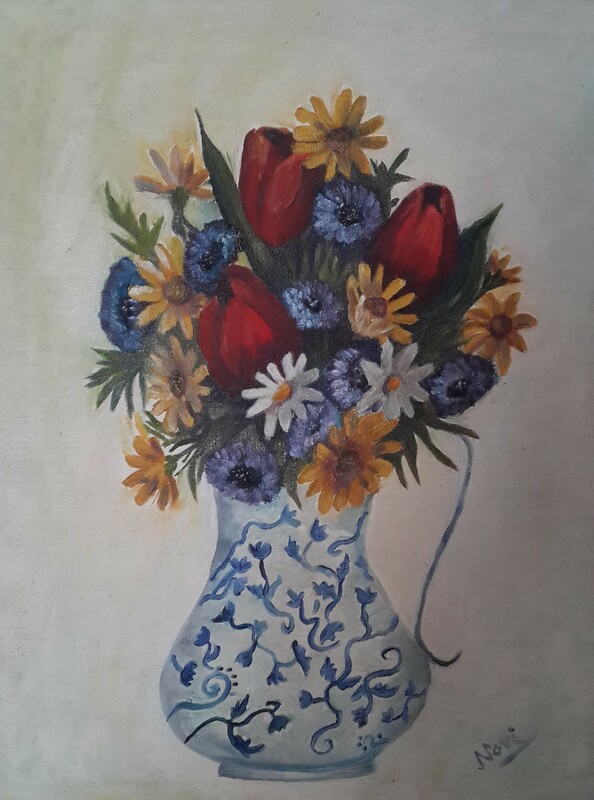 The reds, yellows and whites were used with blues for painting the vase. The colour palette started from titanium white and lemon yellow on one hand to crimson lake, ultramarine blue, cobalt blue and ivory black on the other side. The backdrop of this painting is unique. The flowers seem to be in symphony with the background. The papery petals of poppies change colour as they reflect light. 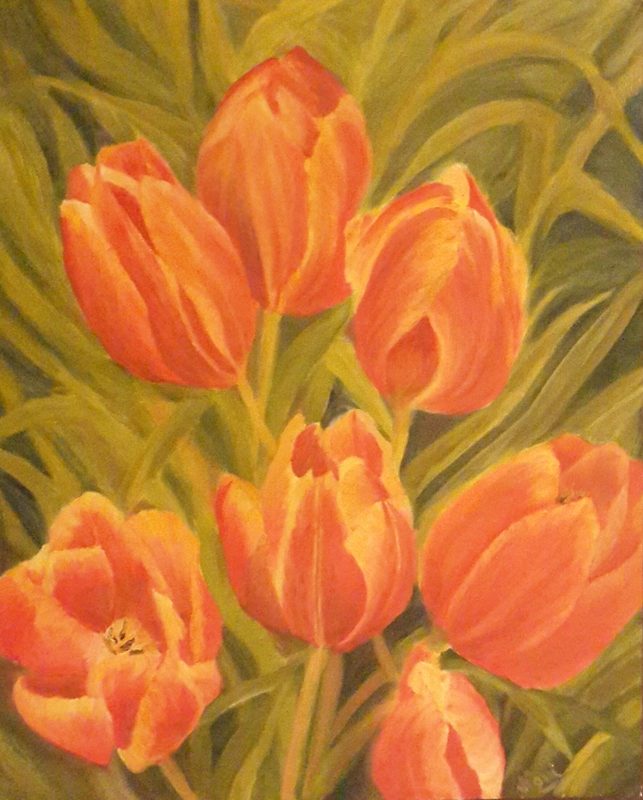 Pictures from the garden served as useful guide for this painting. Poppies with few their petals present an opportunity to any artist learning to paint flowers. 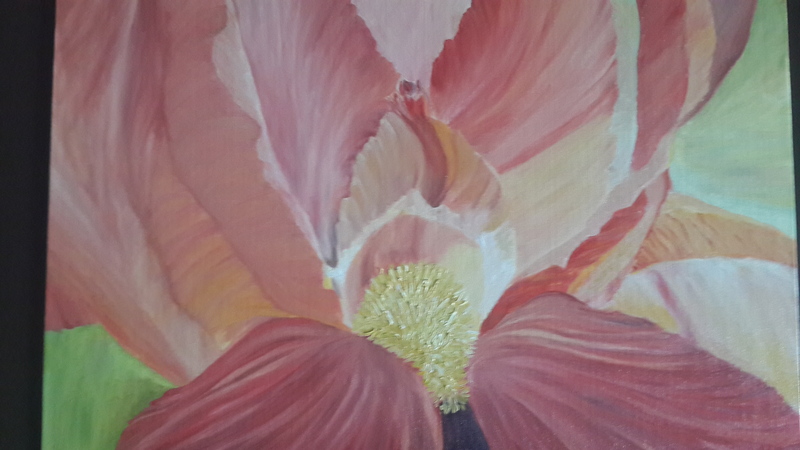 As skill level enhances, more and more layers of petals can be added. 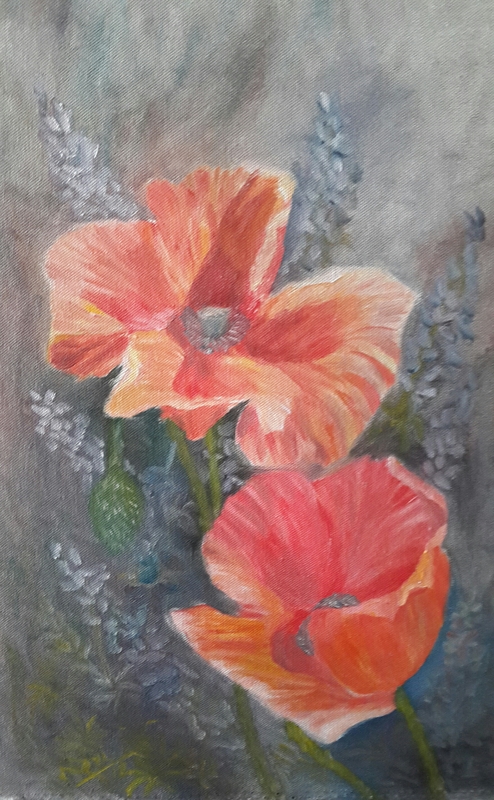 Poppies in my Garden 1 is an original oil painting. 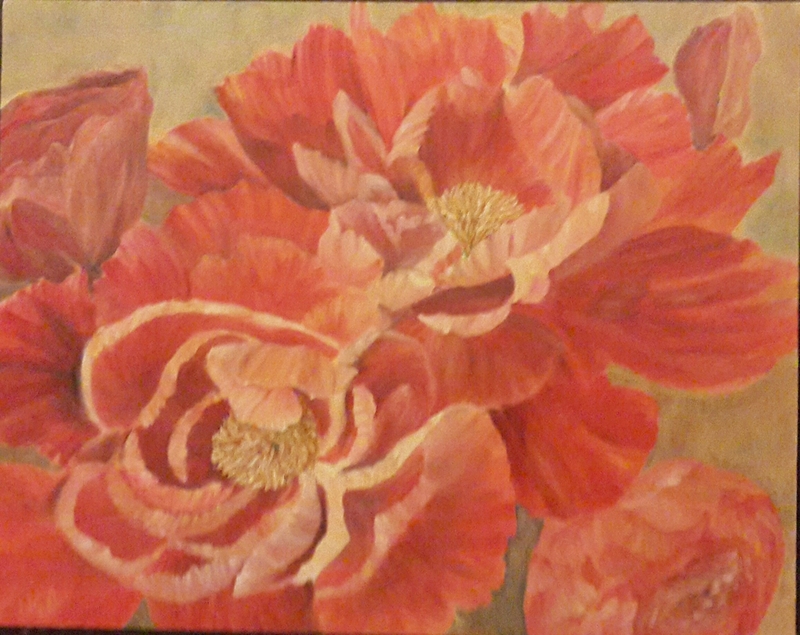 It is a bright painting of five poppy flowers. 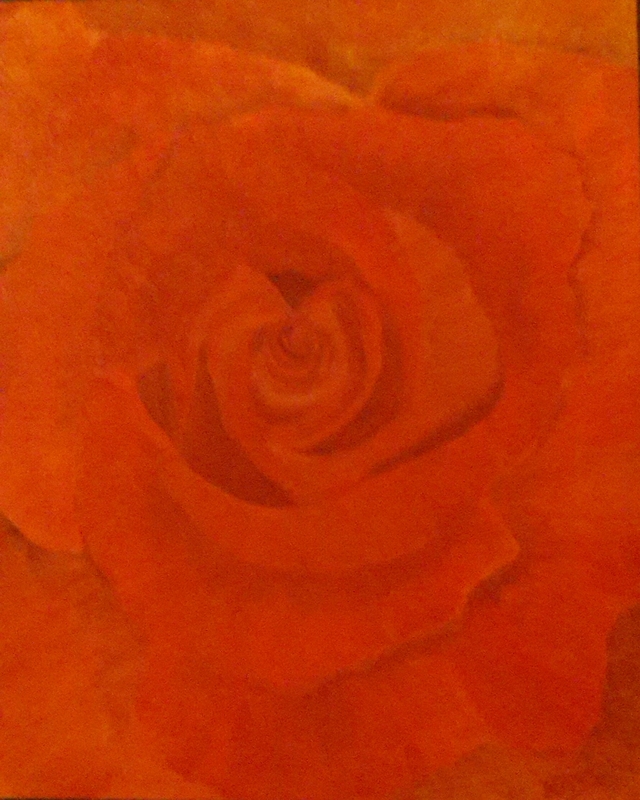 I particularly like this painting because of the orange shine on the petals caused by sunlight. It also has well defined stamens in the lighted area. 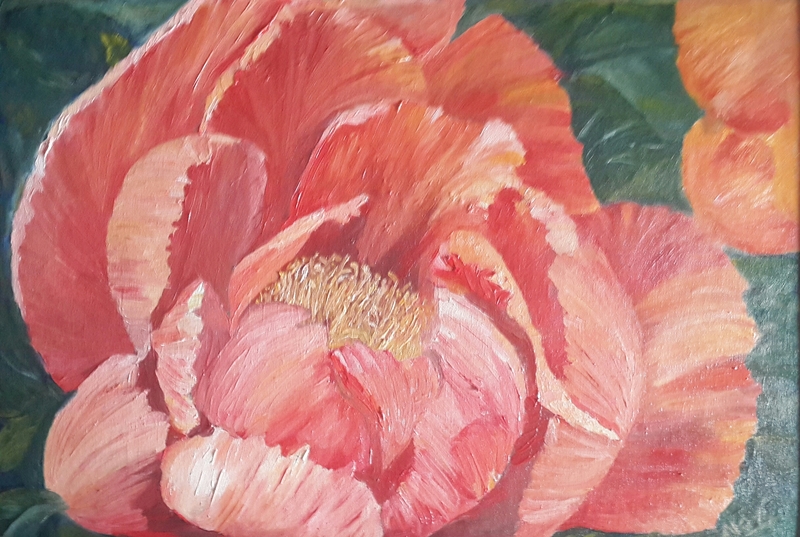 Another highlight of this oil painting is the background white and red flowers that give depth to the painting. The shades of blue on the lower right hand side depict shadows caused by the flowers. 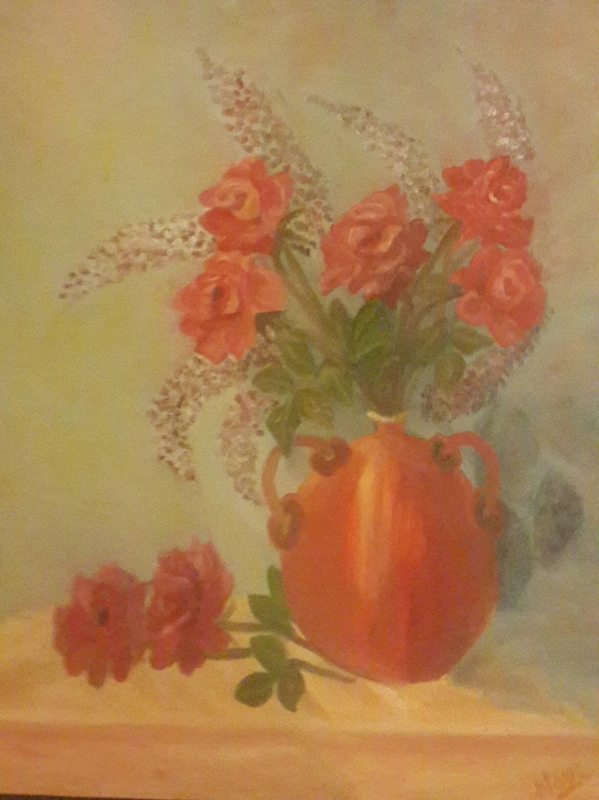 Pink Roses in a Vase is an original oil painting. Pink roses are arranged in a circular formation in a round vase. It was fun painting a light wooden table top. The sharp front edge and the softened rear edge flatten the table. The shape and colour of the vase is different from my previous paintings. The impact of light shining on the vase is depicted through bold brushstrokes. Pink roses illuminate against a textured dark backdrop. I am amazed at the number of colours one can generate with the use of primary colours. Hope you enjoy viewing this painting!